POLICE-PRESS relations dominated the Your Rights session of the NUJ Photographers' Conference on 27 February. 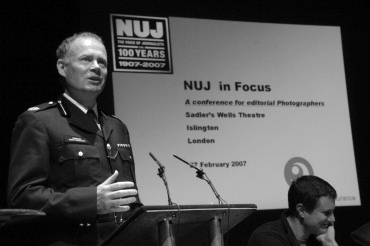 Photographers interrogated Metropolitan Police Commander Richard Broadhurst, responsible for public order policing. "It would be nice if you asked a few questions to the other panellists", he commented. Photographers complained about ill-conceived police "pens" for the press at some events, such as the 7 July bombings and their aftermath. Photographers were still encountering officers who said of the Met guidelines on dealing with the press, "Guidelines, what guidelines?" On a positive note, the chair, NUJ National Executive Council (NEC) member Kevin Cooper, reported that the new training regime of the Police Service of Northern Ireland now has an element on dealing with the media. The Freelance met several photographers who believed the NUJ would only ever let its members use Thompsons, the NUJ's lawyers, to represent them. So here's a reminder of earlier advice: all legal assistance is given at the discretion of the union's NEC, which has the power in exceptional cases to choose a law firm specialising in a particular field, such as suing the police. But it can do this only if you ask the NUJ first . If you contact solicitors before you contact the union, you will cause yourself no end of hassle. See our report on the copyright session at the conference.